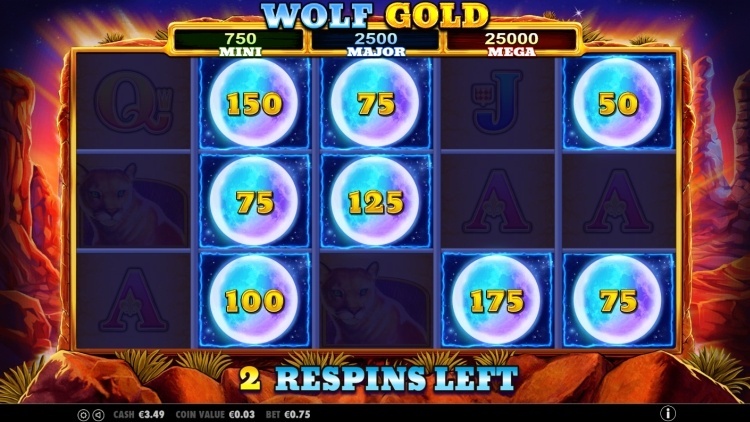 Wild wolves are out to hunt in Wolf Gold, the superb 5 reel, 25 lines video slot by Pragmatic Play. The wild wolf pack is stacked on all reels and will help you get those huge super big wins. Moon symbols trigger the respin feature where all the values get added together, and you can win one of the three jackpots, with payouts of up to 1,000 x your total stake! When you hit the Blazing Reels Free Spins feature, reels 2,3 and 4 spin together as a GIANT symbol, which can also produce amazing wins. Wolf Gold offers players a medium variance. The Blazing Reels Free Spins are particularly volatile. If you manage to line up the right symbols on the 1st and 5th reel, it can pay off. However, should you not be able to connect the same symbols to the GIANT symbol, payouts can be low or even zero. The theoretical Return to Player is 96.01%, which means that out of $100 you stake on this slot, $96 will be paid back to you in the long run. 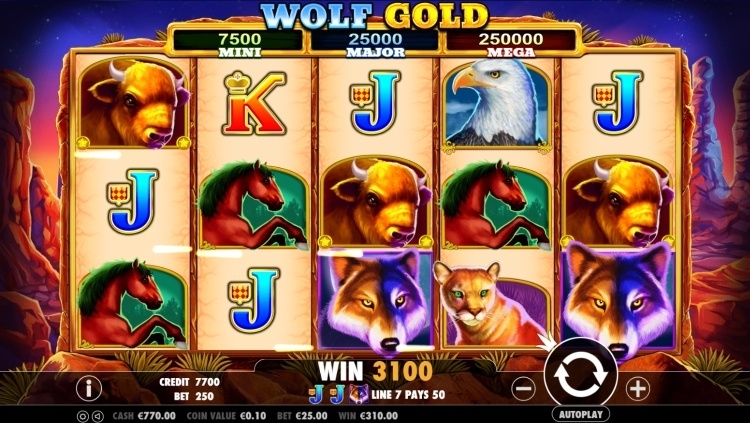 How does the Wolf Gold slot work? This slot, with a distinct Wild West theme, is beautifully designed. The wild animals, such as the Wolf, Mountain Lion, Buffalo and Eagle look dangerous and attractive at the same time. The Wolf symbol is stacked and acts as the Wild Symbol, substituting all other symbols except the scatter symbol. 5 Wolf symbols on an active pay line pay out 20 x the total stake. Other high paying symbols include the Buffalo (20 x total stake) Eagle (16 x total stake) and the Wild Horse (12 x total stake). The card symbols are worth 4 times the stake on a 5-of-a-kind. 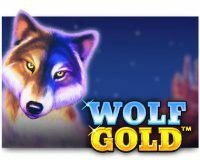 Pragmatic Play’s Wolf Gold offers two exciting bonus features, and although we like them both, we have a slight preference for the Money Respin Feature, as that’s where big money is. 3 scattered “Monument Valley” symbols on reels 2, 3 and 4 activate the Blazing Reels Free Spins. You are awarded 5 free spins, with reels 2, 3 and 4 combined to make one GIANT symbol. If the symbols on reel 1 and, hopefully, reel 5 connect with the middle symbol, you are up for some very nice wins. It is even possible to win the Money Respin Feature or to retrigger the bonus. This is an exciting bonus that can pay out huge amounts of money but can just as easily disappoint. When 6 or more Moon Symbols hit, you get the chance to win one of the 3 jackpots, with prizes of up to 1.000 x your total bet! You start with 3 free respins and this number is reset every time you hit at least one new Moon Symbol. Each Moon Symbol contains either a credit prize or one of the 3 jackpots: the Mini, Major of Mega Jackpot. The Mini pays 30 x your stake, the Major pays 100 x your stake, and the Mega Jackpot pays a whopping 1.000 times your total stake! When no new Moon Symbols appear, the bonus ends and all credit values are added together for a final total payout. 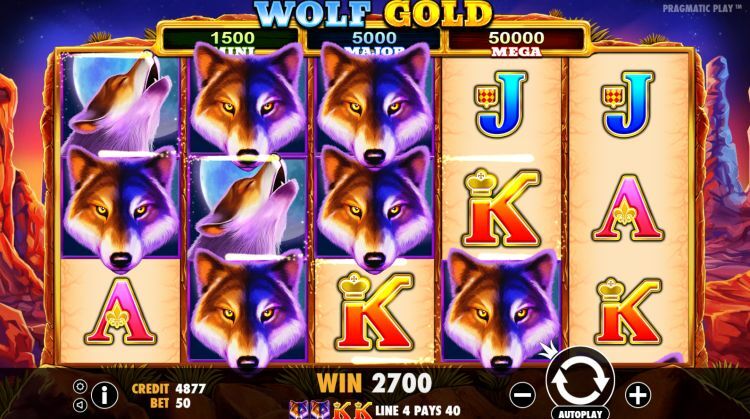 In our opinion, Wolf Gold will prove itself to be one of Pragmatic Play’s most popular slots. It features beautiful graphics, exciting bonuses and plenty of thrills. If you have not played Wolf Gold yet, you should. It is one of the best new releases of 2017. 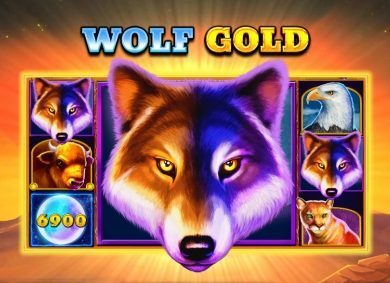 You can play Wolf Gold at most reliable online casinos. One of those online casinos is Mucho Vegas. This casino has an excellent welcome package that includes deposit bonuses on the first 7 (!) deposits plus up to 150 free spins. Visit Mucho Vegas for a 100% bonus up to £$100 and 150 free spins.